Special feature: Matsu Karigane Sukashi Tsuba. 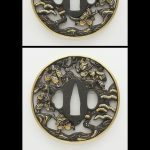 On the iron Migaki tsuba, Matsu Karigane no zu is engraved with openwork. Condition is very great.